Bond will eventually become Onatopp's main squeeze. While investigating the theft of an advanced helicopter, James Bond (Pierce Brosnan) stumbles upon a plot to destroy the British government. To make matters worse, 007 finds the plan is masterminded by none other than….006 (Sean Bean). 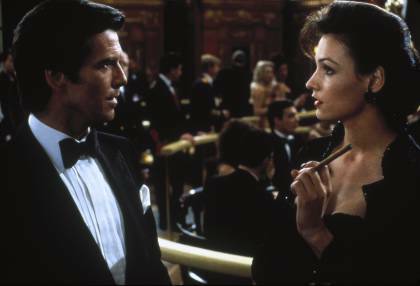 GoldenEye marks Pierce Brosnan’s first outing as the British superspy, and is also the first Bond film of the 90s. That said, what is most obvious was how director Martin Campbell was updating Bond for the post-Cold War era. From the score (particularly the theme played during the opening gunbarrel sequence) to the absolutely ridiculous action sequences (all you need to see is how Bond escapes the chemical facility in the opening scene), GoldenEye really wanted to be a modern action movie. Unfortunately, that is precisely what caused GoldenEye to age very poorly; even older movies like Goldfinger don’t feel as hopelessly outdated. In particular, what made the movie feel laughably dated was how technology was an important part of the plot. One scene that comes to mind is when Natalya (Izabella Scorupco) poses as a customer for IBM’s (Yes, there was such product placement) latest computers and she outlines the specs she wants, such as a 500 MHz processor and a CD-ROM drive. Let’s not even go into how people still used dial-up modems to log into the Internet. For that reason it seems like even the later Bond films, like The World is Not Enough, opted for more of a classic Bond feel. Despite all that, I can see why GoldenEye is considered Brosnan’s best Bond film. It was definitely refreshing and did a good job of making Bond feel relevant again after the end of the Cold War. It was nice seeing how to a certain extent, GoldenEye was actually parodying the Bond franchise as a whole. Being that it is a Bond film, I suggest picking it up purely for its fun factor. It is the Bond film that dared to to be different before there was a Casino Royale (I’m not counting the parody starring David Niven) and it had arguably one of the better villains from the series.